So what are we talking about when we’re speaking of intervals? We are talking about two notes, and trying to name the distance between them. Also, I’ll tell you ahead of time that the name of each interval has a numeric portion, and some word that identifies it more specifically. For now, we’ll just consider the numeric part. To do this, you can ignore any sharps or flats, and just consider the letter names. So to keep things simple, we’ll just consider the notes named with plain letters, without any sharps or flats. This is peculiar, in a way that will be explained later. What happens when your interval leaps up by two Cs? It could be a fifteenth, but doesn’t it feel like some fancy erudite term is called for? After all, the interval starts on a C and ends up back on a C, similar to the erudite unison and octave intervals. It is actually called a fifteenth, but you can also use the term “double octave” if it makes you feel more scholarly. Here’s a picture to help further cement the concept of how the numbers work. If you are any sort of computer nerd, you are well aware that had these interval names been invented in the past 30 years or so, they almost certainly would have started their numbers at zero for the two identical notes. It is a bit mathematically odd that the interval containing zero distance has the number 1. Jumping up two Cs would seem to be twice as far as jumping up one C. But jumping up one C gives us an octave, and jumping up two Cs gives us a fifteenth. Clearly 15 is not 8 doubled. How can this be? The answer is that to move up an octave, we advanced up from C by seven notes; we got one extra count for free because we already had a count of one when we were still on the same note. So although an octave is supposedly an interval of eight, it moves up from the bottom by seven notes. 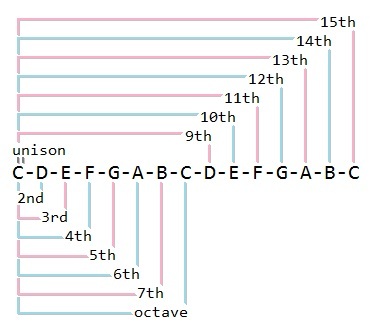 So two octaves are a fifteenth (1-for-nothing + 7 + 7). Three octaves would then be an interval of a twenty-second (1 + 7 + 7 + 7), but let’s not even think about that for now. What does it mean to invert an interval? For intervals one octave or less, we’ll define inversion as what happens when you move the lower note up by an octave. For example, suppose you have the interval from C to E, which as we saw earlier is a third. To invert it, we move the C up by an octave, so that now the C is above the E.
The first interval was C to E, as shown on the left above. To invert it, we changed from the C on the left to the other C on the right. The original interval from the C to the E goes part of the way up the octave, and the inverted interval goes from the E up to C, the rest of the way up the octave. Consider the intervals indicated in the picture above: C to E, E to G, G to C. Counting them out, we get C-D-E (a third), E-F-G (another third), and G-A-B-C (a fourth). So they’re a third, a third and a fourth respectively. But what do they add up to? 3+3+4=10! So by including yet another interval in the sum, yet another one for nothing gets added. Hence when inversion splits up one octave into two intervals, the second interval adds one for nothing and the sum of the intervals is nine. Previously we talked about half steps and whole steps. But at the time we also mentioned that all of the white keys on the keyboard (the ones with just plain letter names that we’ve been talking about) are not the same distance apart. Some adjacent white keys are a whole step apart, and some differ by only a half step. So though we have given the intervals labels according to the letter distance, these labels do not tell us how many half steps or whole steps comprise the interval. Whether the letter distances are whole steps or half steps doesn’t affect the way we count the interval numbers. So if someone asked you how many half steps are in a third, the correct answer would be, “I don’t know.” With the knowledge in the earlier article you can easily figure out that, for example, the number of half steps in the interval of a third from C up to E is not the same as the number of half steps in the interval of a third from D up to F.
So the numeric naming of intervals is totally independent from how many half steps the interval contains, and that is rather peculiar. In fact, it is possible to have two intervals with different number designations that have the same number of half steps! But that is a topic for another article.